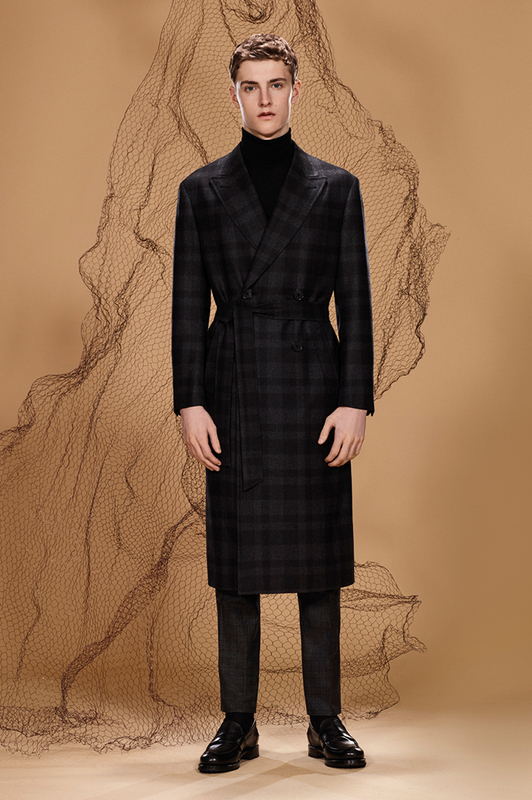 Wool-cashmere-silk double-constructed overcoat with madras check, pure wool suit consisting of double-breasted blazer and flat-front pants, buffed calfskin Goodyear boots. 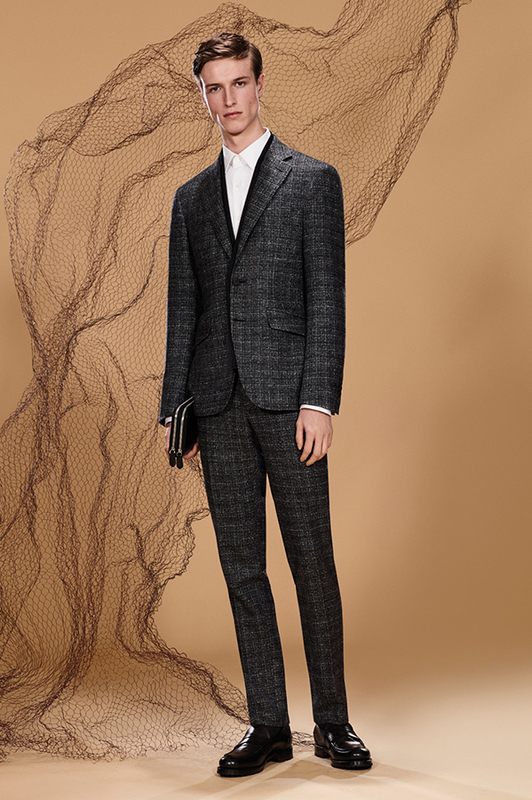 Pure wool Prince of Wales check mélange double-breasted blazer with contrasting phone pocket, pure wool herringbone mélange pants, buffed calfskin Goodyear boots. 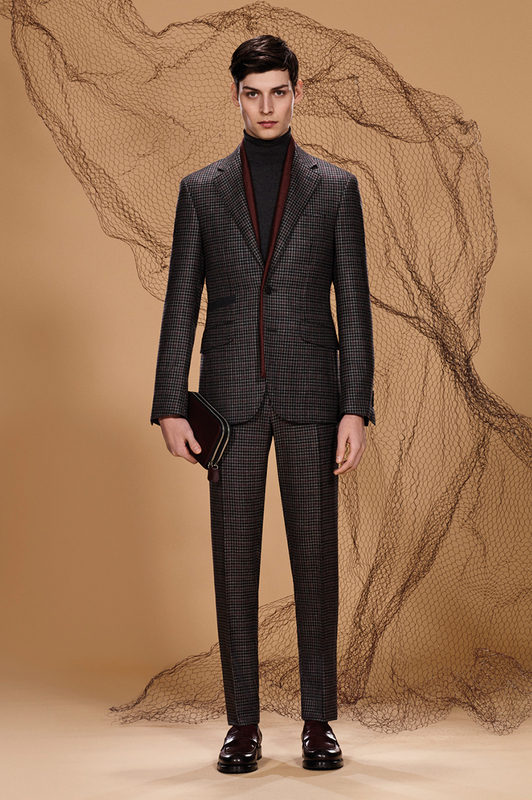 Pure wool macro-madras check double-breasted overcoat with peak lapels, wool-cashmere-silk-vicuña micro-Prince of Wales flat-front pants with brown over-check, pure combed cashmere turtleneck, buffed calfskin Goodyear loafers. 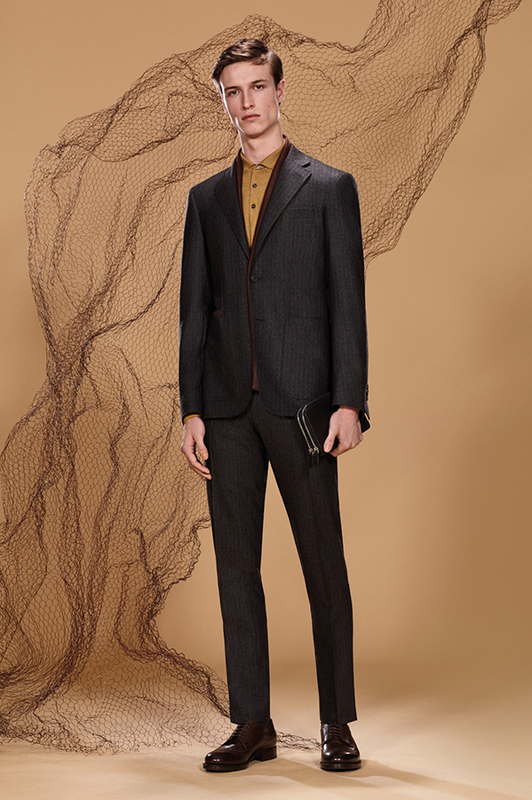 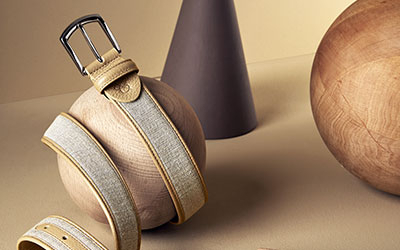 Wool-silk-linen suit with woven effect consisting of single-breasted blazer with contrasting ticket pocket and flat-front pants, cotton stretch shirt, buffed calfskin Goodyear loafers, calfskin travel wallet. 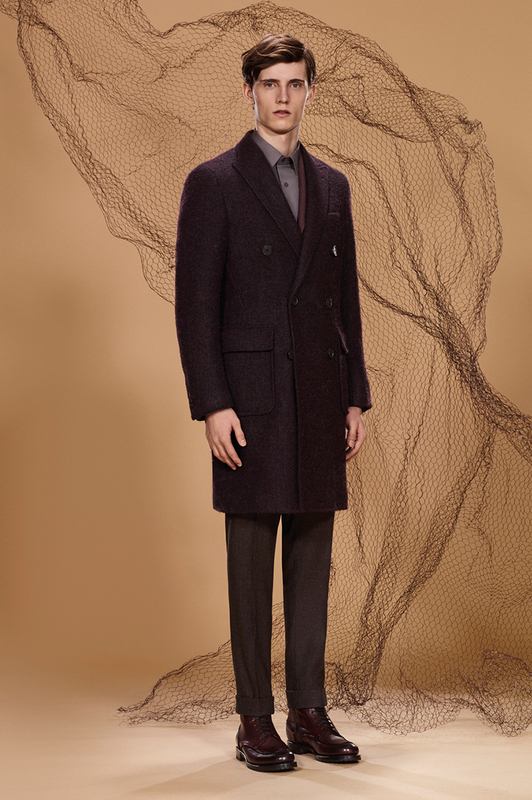 Pure wool double-breasted overcoat with peak lapels and jacquard Prince of Wales motif, pure wool suit with jacquard Prince of Wales motif consisting of single-breasted jacket and flat-front pants, stretch cotton shirt, buffed calfskin Goodyear loafers. 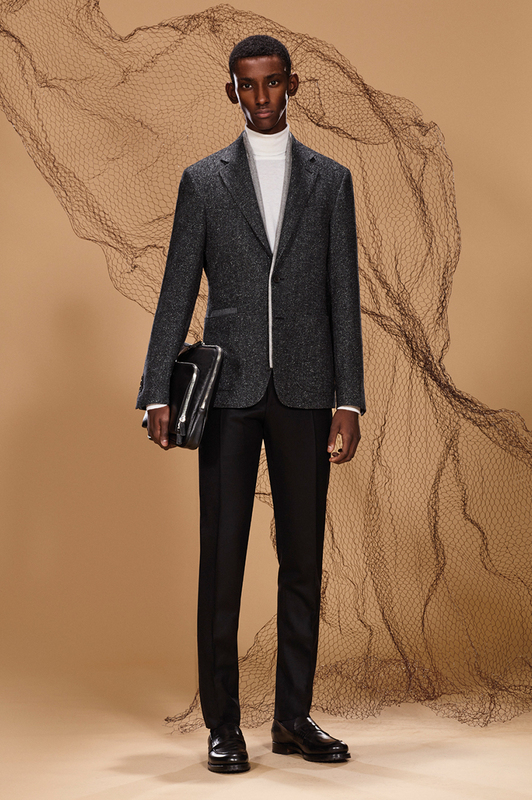 Wool-silk-cashmere single-breasted blazer with herringbone motif, pure wool flannel flat-front pants, pure combed cashmere turtleneck, buffed calfskin loafers, calfskin document holder with front pocket. 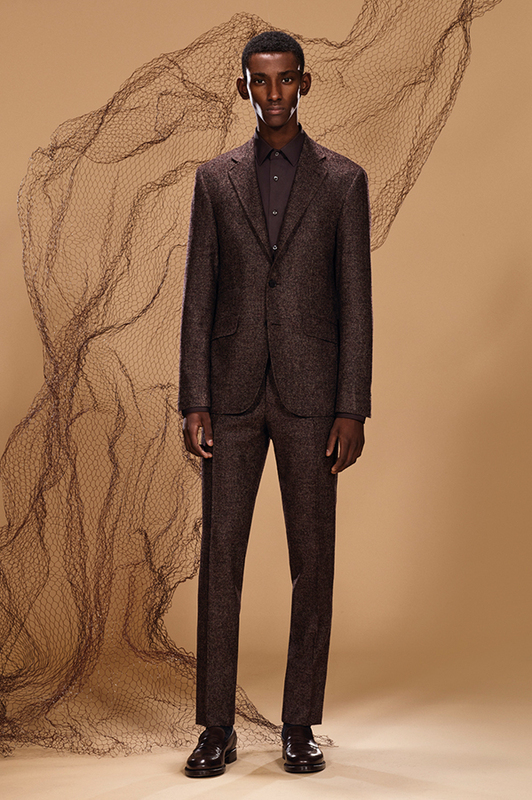 Pure wool birdseye mélange suit consisting of double-breasted jacket with contrasting ticket pocket and flat-front pants, buffed calfskin Goodyear boots. 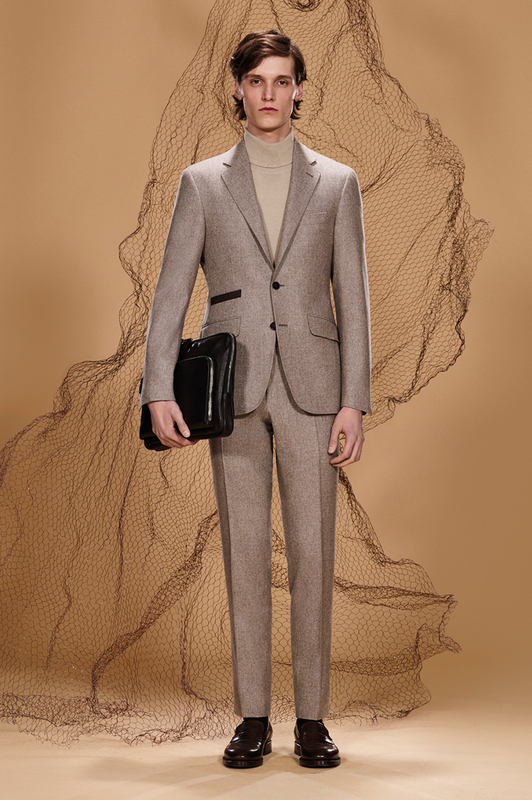 Wool-silk-linen multi-blended suit consisting of single-breasted blazer with contrasting ticket pocket and flat-front pants, pure cotton poplin shirt, buffed calfskin Goodyear boots, calfskin document holder with front pocket. 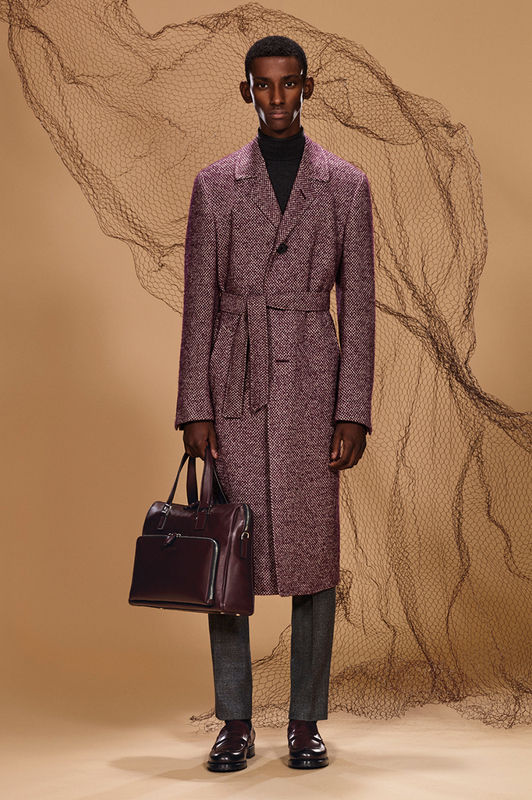 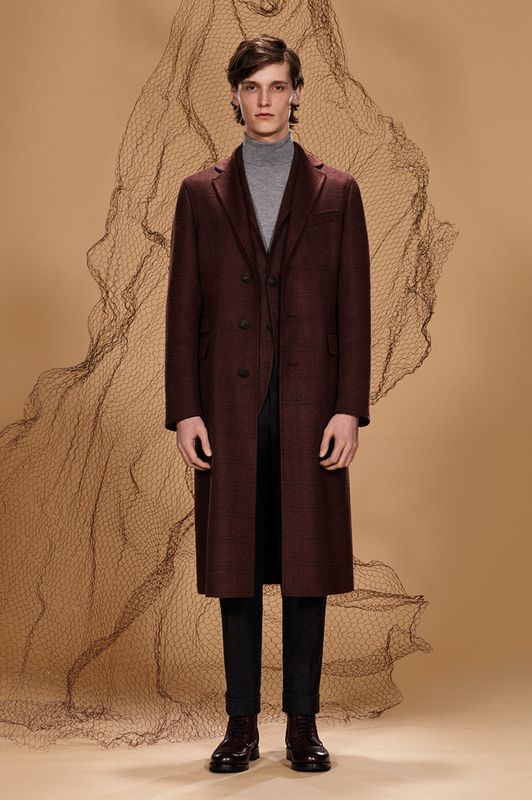 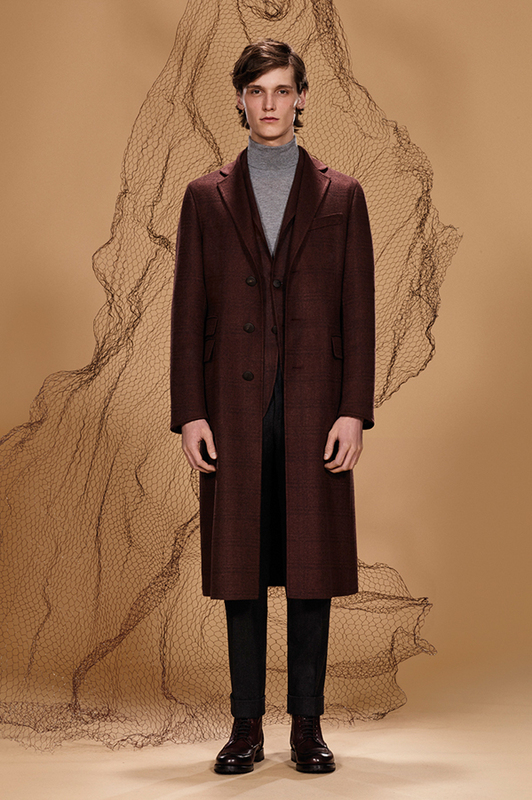 Wool-alpaca overcoat with Bordeaux-beige rice grain motif, pure wool flat-front pants with mélange effect, pure combed cashmere turtleneck, buffed calfskin Goodyear loafers, calfskin bag with front pocket. 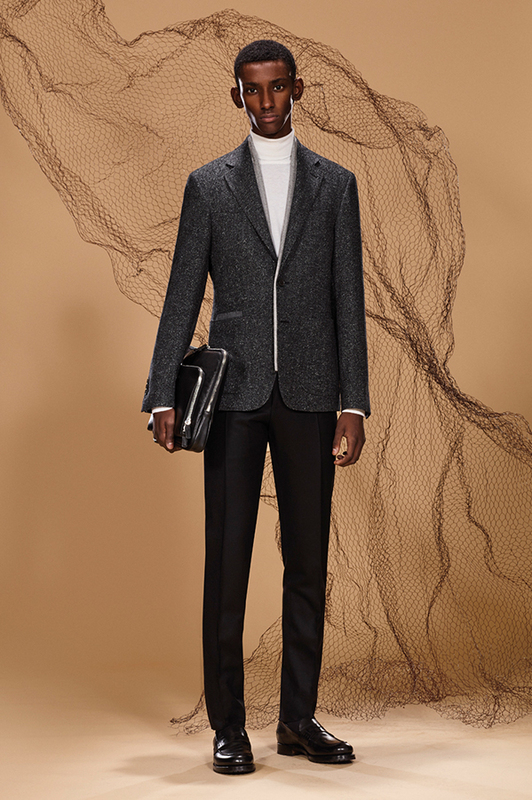 Pure wool herringbone suit consisting of single-breasted blazer with contrasting ticket pocket and flat-front pants, pure combed cashmere turtleneck, buffed calfskin derby shoes, calfskin travel wallet. 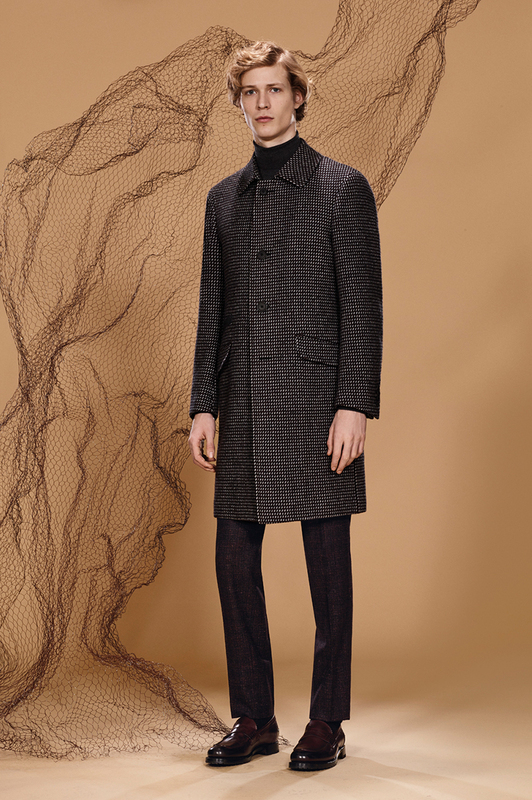 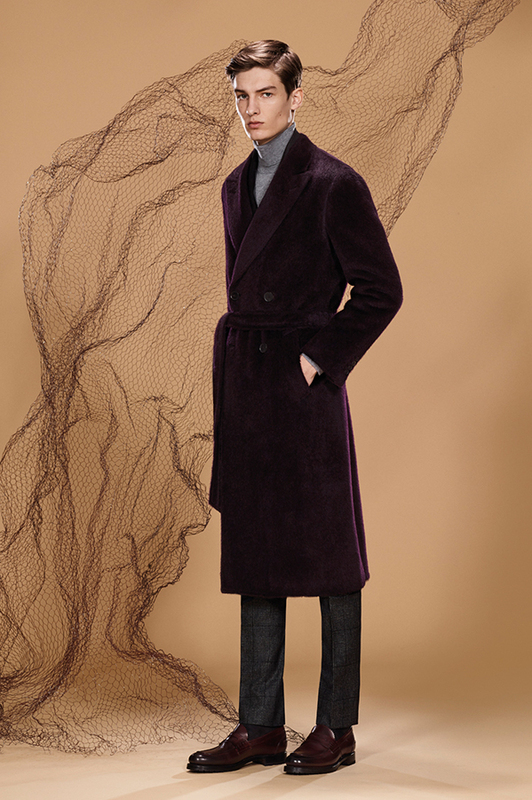 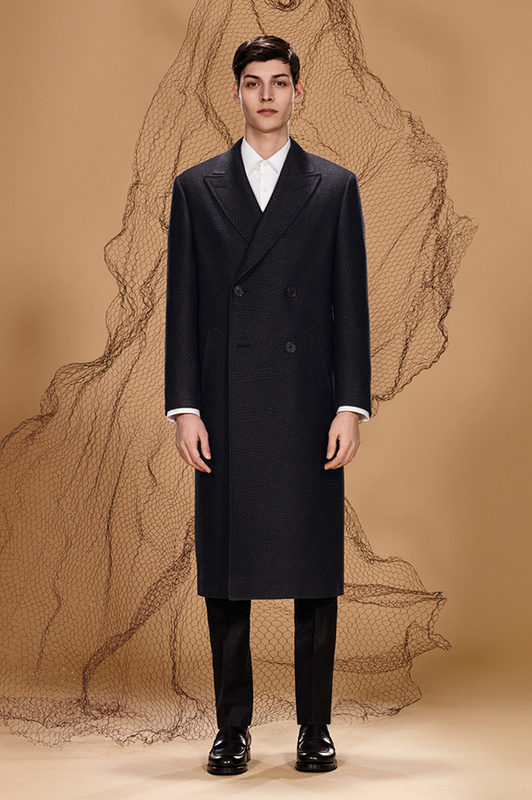 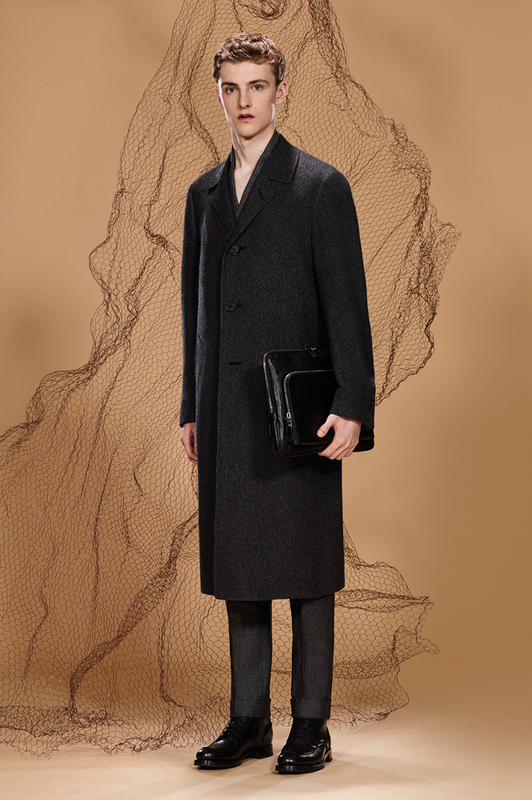 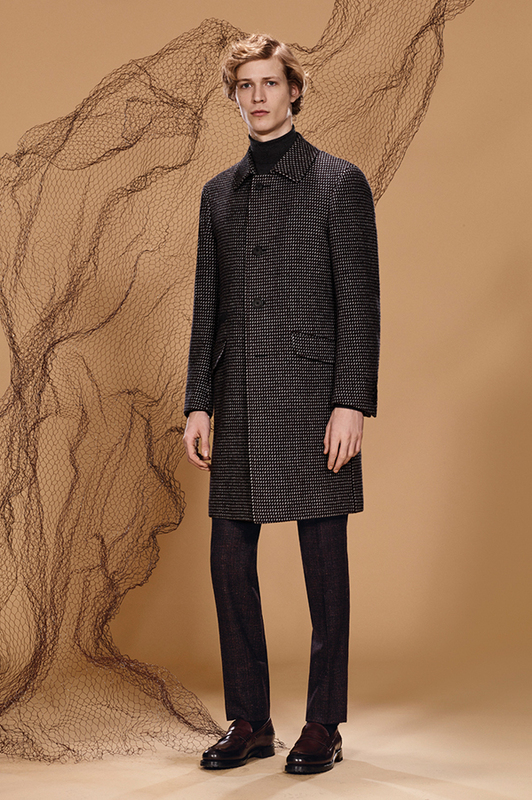 Baby alpaca and wool double-breasted overcoat with velour effect and peak lapels, silk-cashmere double-constructed two-button blazer, pure wool flat-front pants with Prince of Wales check, pure cashmere turtleneck, buffed calfskin Goodyear loafers. Pure wool tweed single-breasted overcoat with shirt collar and flap pockets, pure combed cashmere turtleneck, wool-silk-linen multi-blended flat-front pants, buffed calfskin Goodyear loafers. 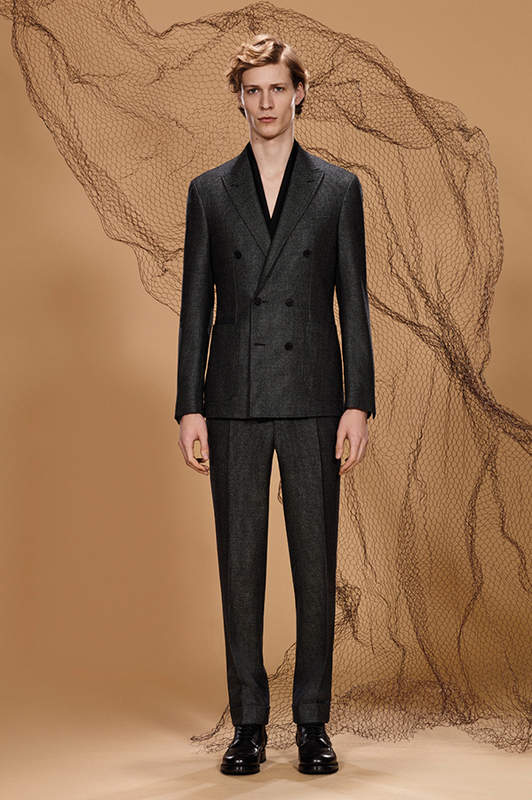 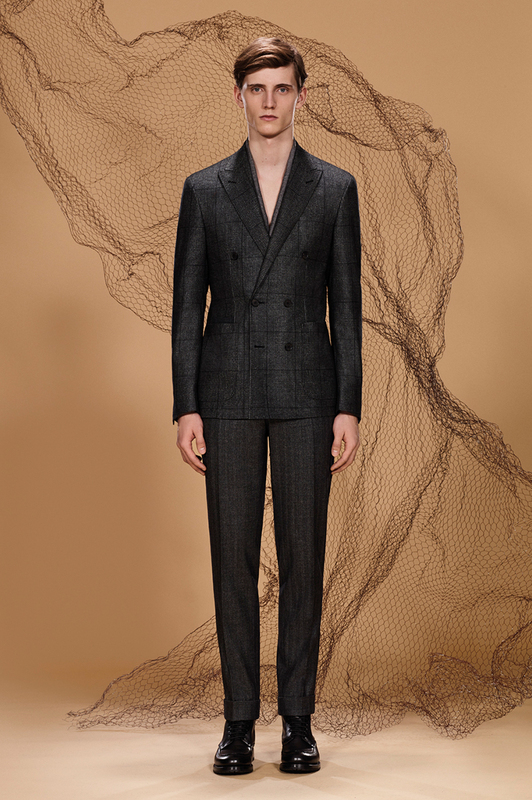 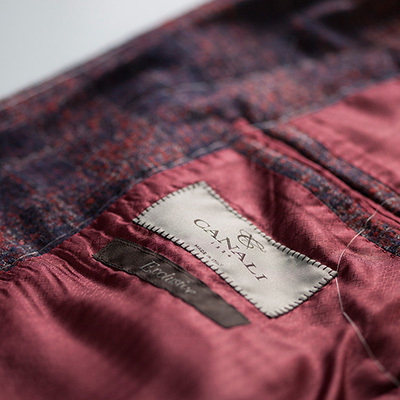 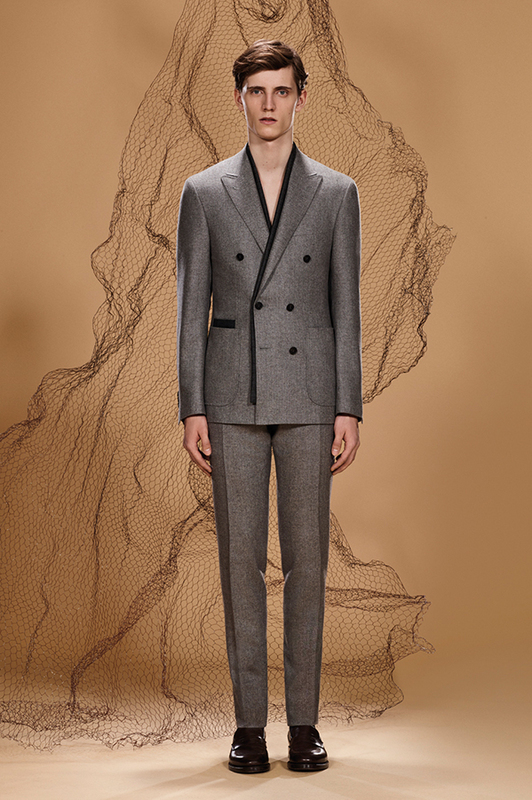 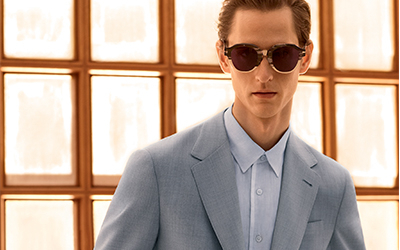 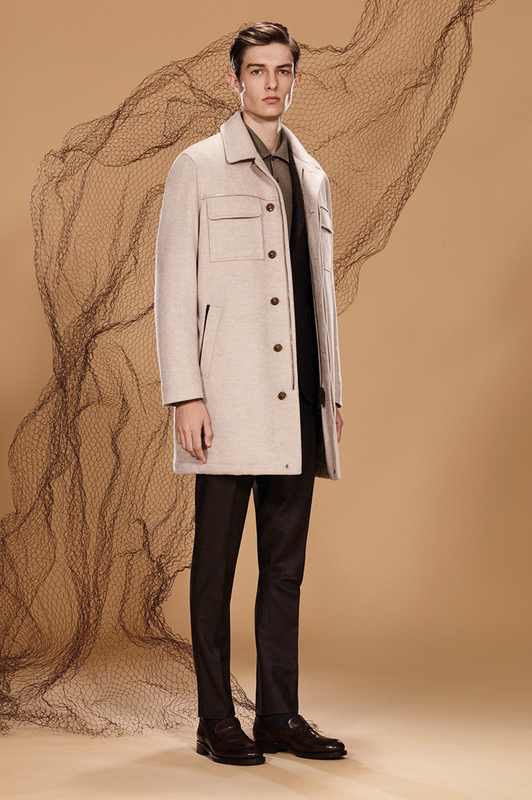 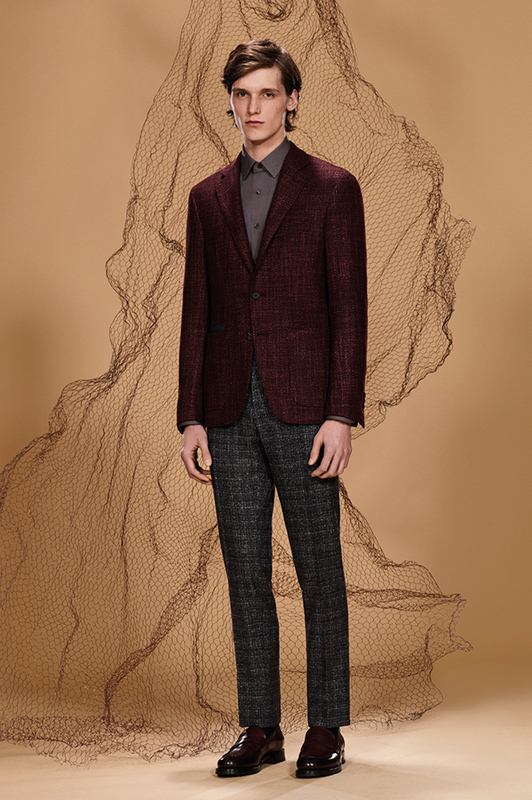 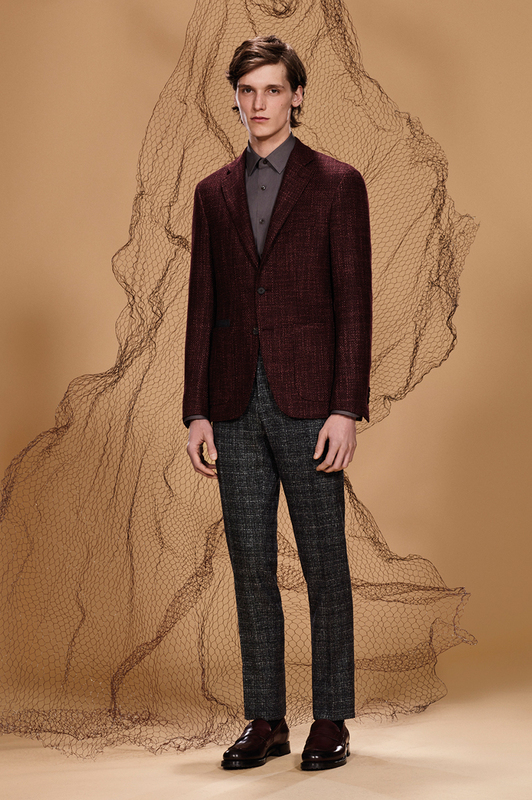 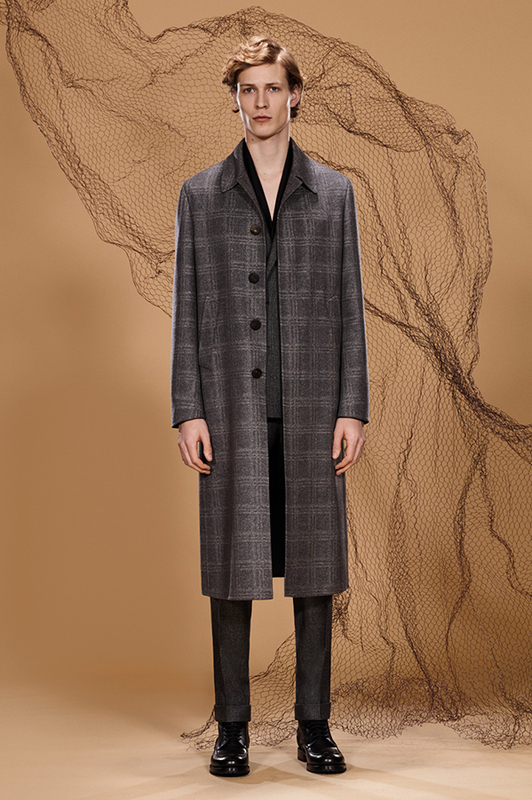 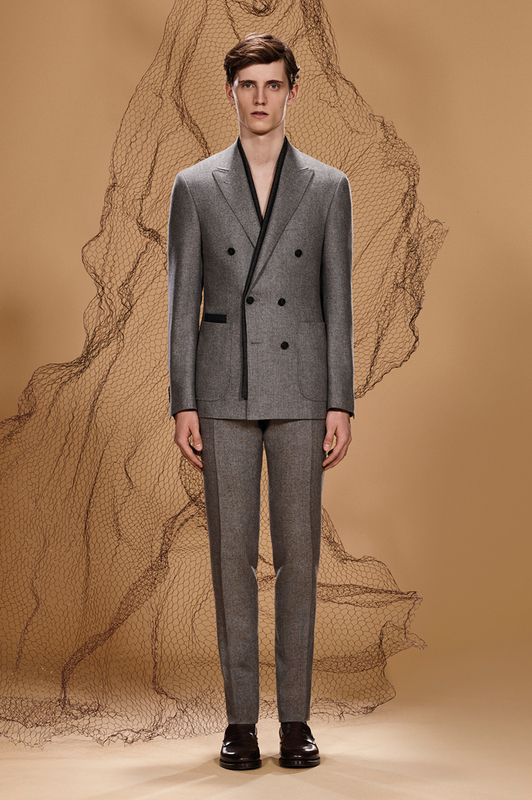 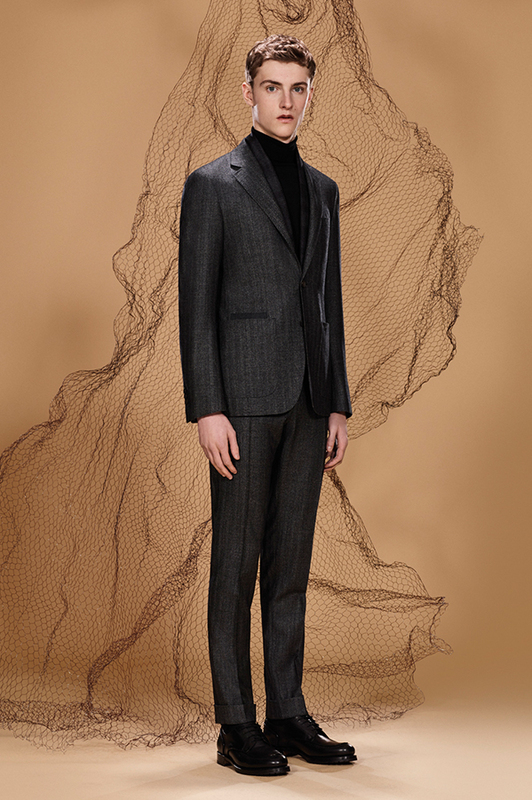 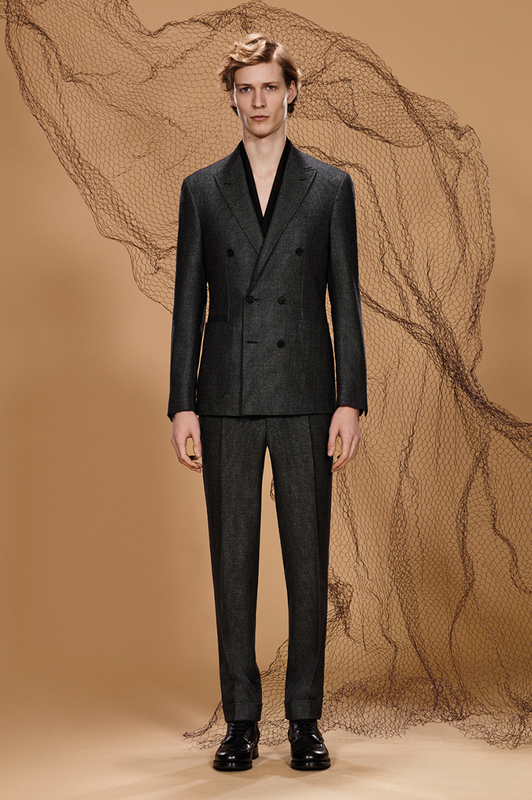 Wool-silk single-breasted jacket with macro-woven effect and contrasting phone pocket, wool-silk-linen flat-front pants with woven effect, pure cotton poplin shirt, buffed calfskin Goodyear loafers. 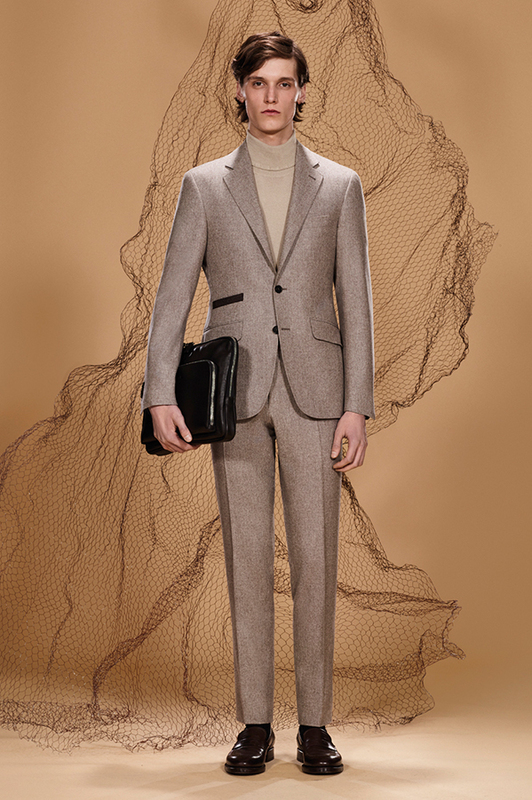 Cashmere-vicuña suit with micro over-check motif consisting of single-breasted blazer and flat-front pants, pure combed cashmere turtleneck, buffed calfskin Goodyear loafers, calfskin travel wallet. 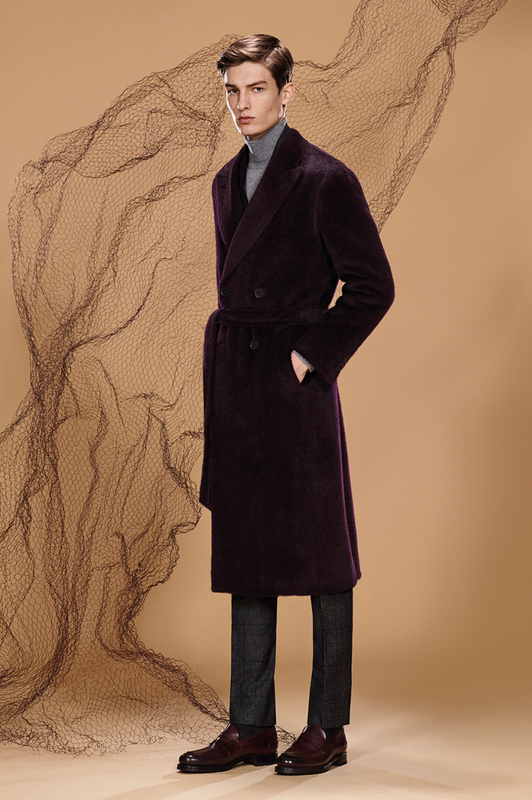 Double-breasted overcoat in wool-alpaca-mohair-silk bouclé mélange with peak lapels and maxi-patch pockets, ultra-soft silk-cashmere single-breasted blazer with contrasting phone pocket, cashmere-chinchilla herringbone pants, pure cotton shirt, leather Goodyear boots. 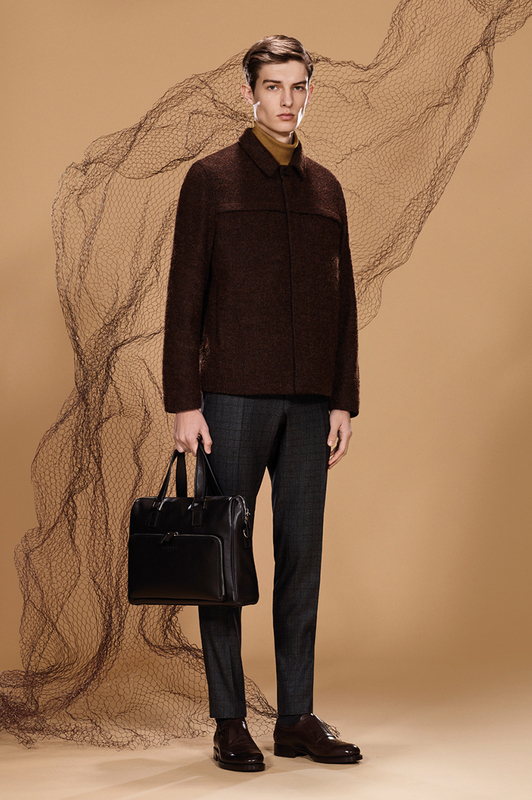 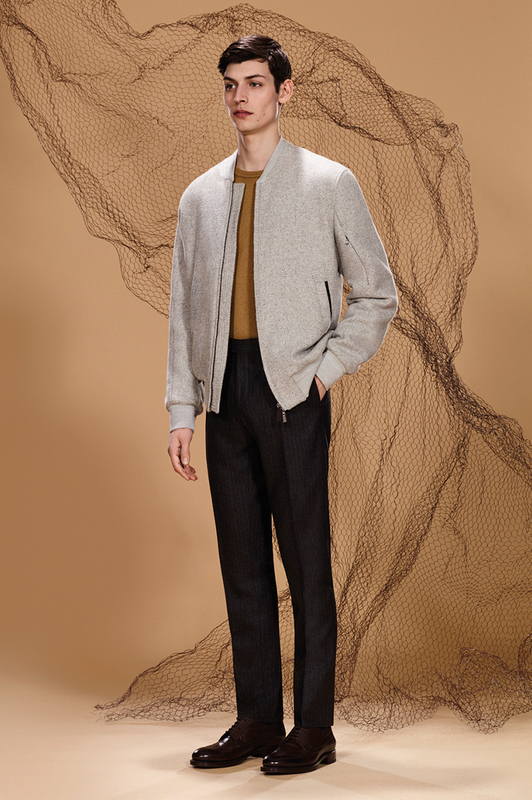 Bouclé wool-alpaca-mohair-silk bomber jacket with two hidden pockets at chest, wool-cashmere-silk-vicuña flat-front pants with gray micro-Prince of Wales check and brown over-check, cashmere-silk turtleneck, vegetable-dyed calfskin Goodyear brogue monk strap shoes, calfskin bag. 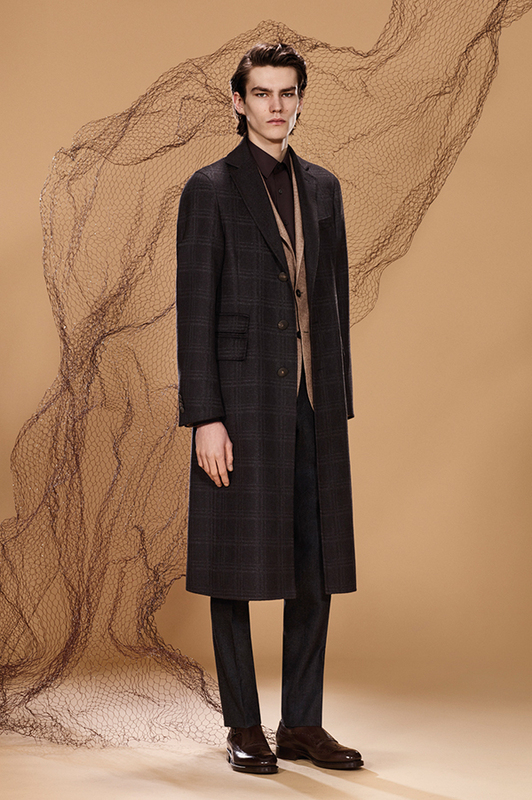 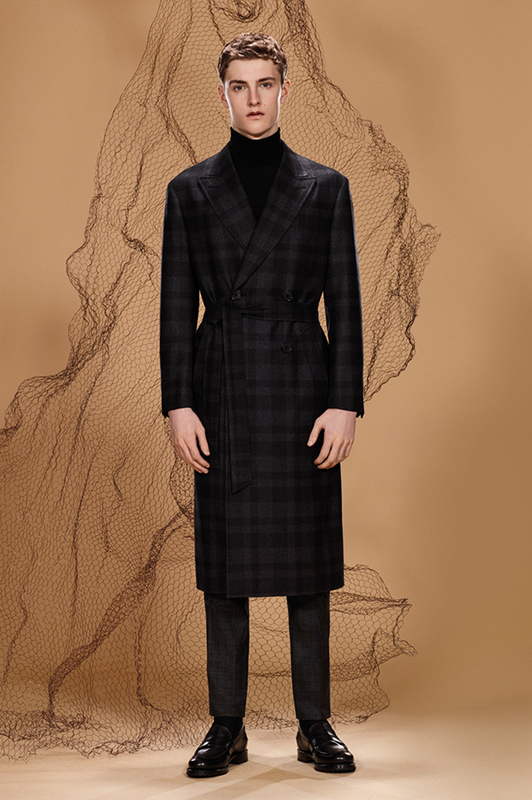 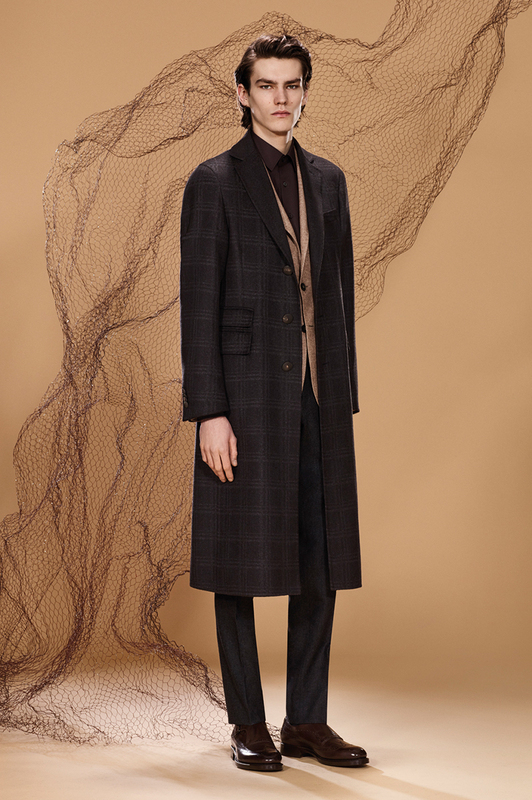 Wool, cashmere and silk double-constructed overcoat with madras check and flap pockets, silk-cashmere double-constructed two-button blazer with madras check, pure wool flat-front pants, pure cashmere turtleneck, buffed calfskin Goodyear boots. Pure wool suit with mustard-brown pinstripes consisting of single-breasted blazer with contrasting phone pocket and flat-front pants, cashmere-silk long-sleeved polo shirt with frosted effect, vegetable-dyed Goodyear derby shoes. 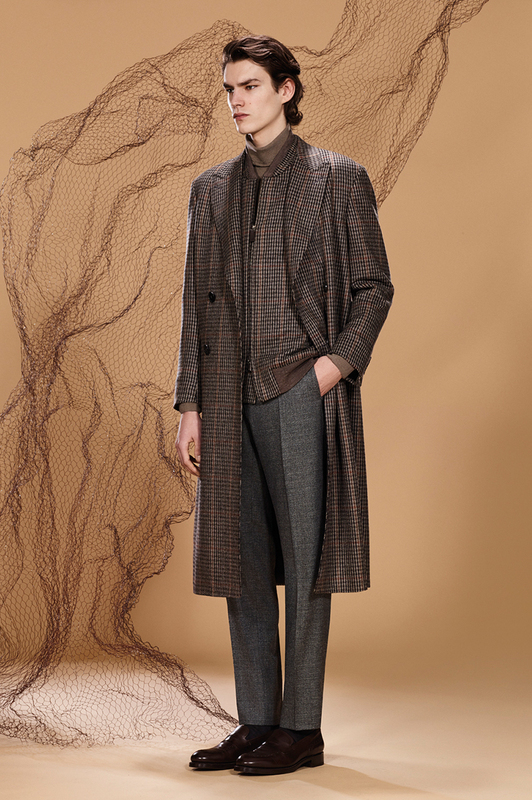 Wool-cashmere-silk double-constructed overcoat with madras check and flap pockets, silk-cashmere single-breasted blazer with contrasting phone pocket, pure wool carded flannel flat-front pants, pure cotton poplin shirt, vegetable-dyed calfskin Goodyear monk strap shoes with brogueing. 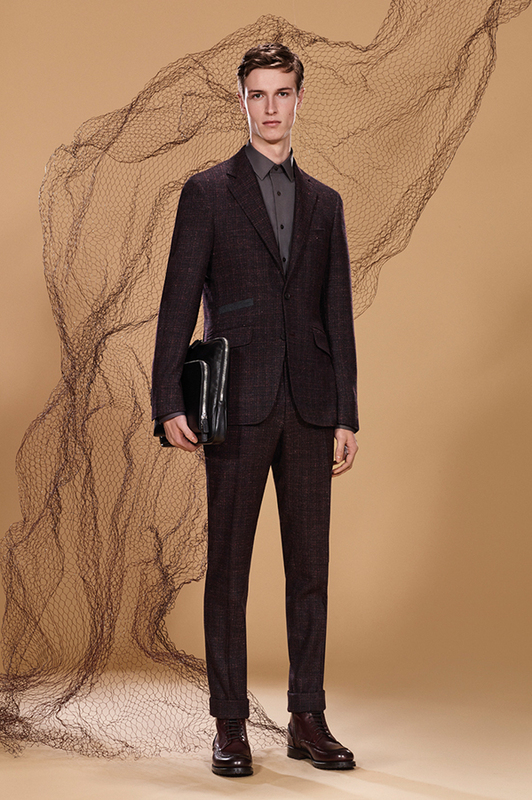 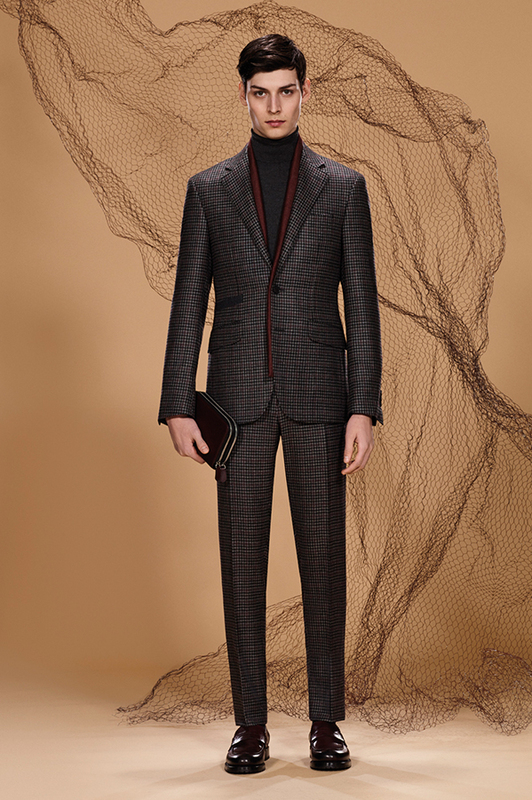 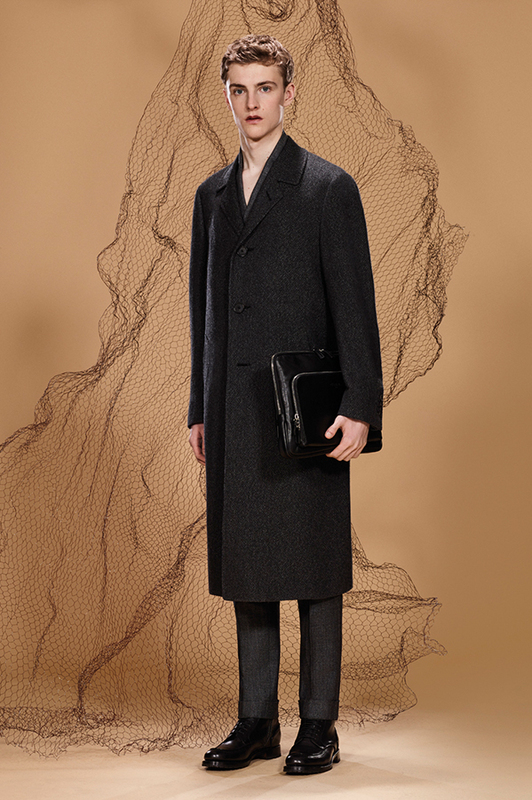 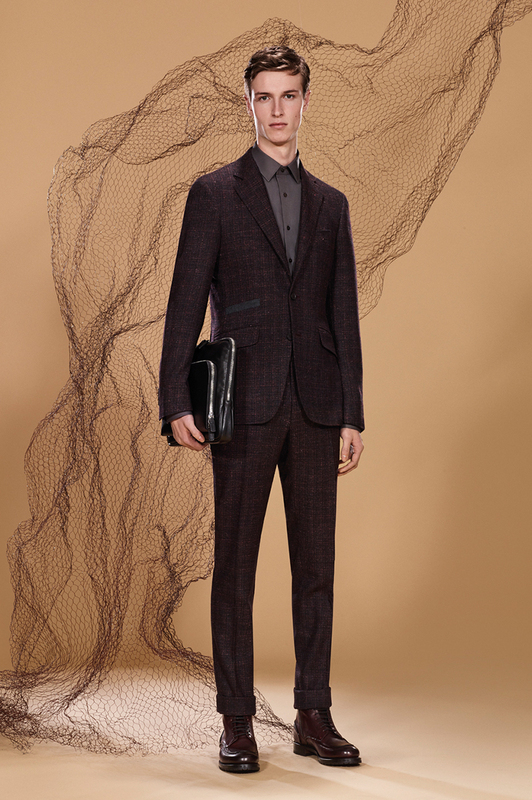 Pure carded wool flannel suit consisting of single-breasted jacket with contrasting ticket pocket and flat-front pants, cashmere-silk turtleneck with frosted effect, vegetable-dyed calfskin Goodyear loafers with brogueing, calfskin document holder with front pocket. Pure cashmere tricot bomber jacket with knitwear effect, cashmere-silk crew neck sweater with frosted effect, pure wool flat-front pants with mustard-brown pinstripes, vegetable-dyed calfskin Goodyear derby shoes. 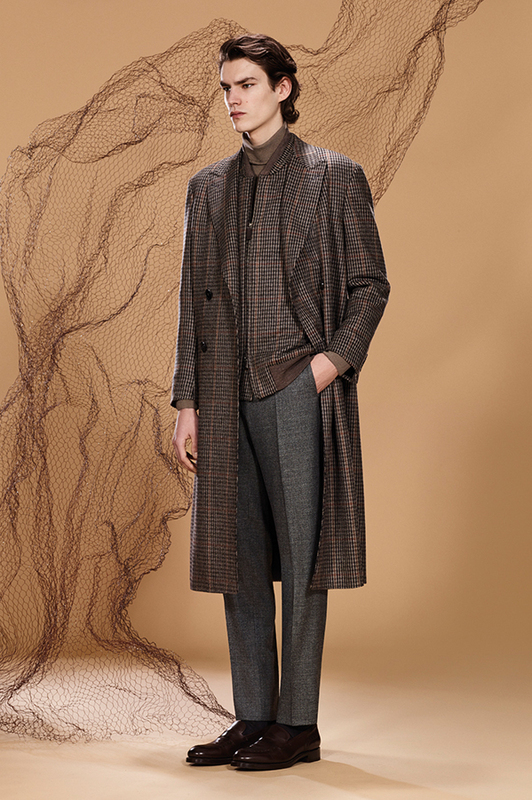 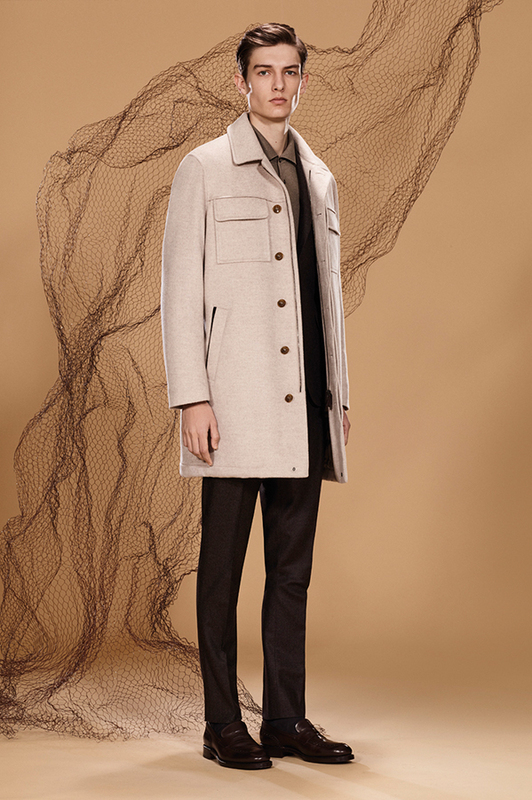 Pure cashmere sable-effect long field jacket, cashmere-chinchilla suit consisting of single-breasted herringbone jacket and flat-front pants, cashmere-silk long-sleeved polo shirt with frosted effect, vegetable-dyed calfskin Goodyear loafers. 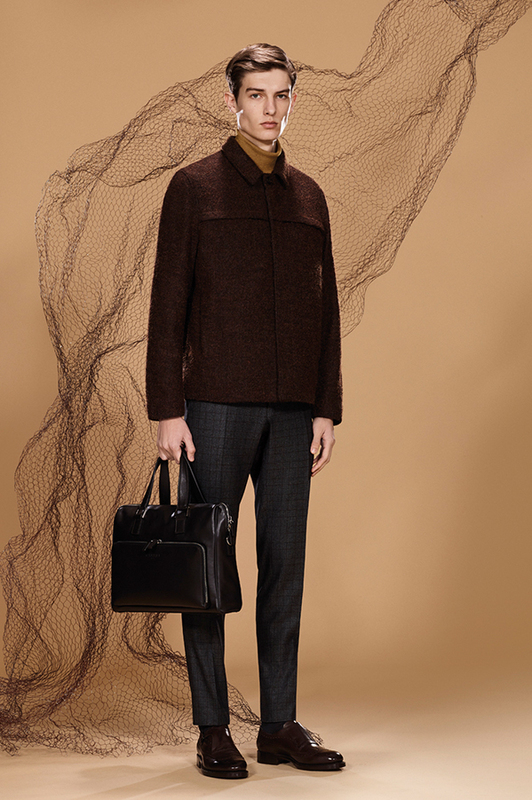 Wool-cashmere double-breasted overcoat and wool-cashmere bomber jacket with beige-gray houndstooth motif and mustard over-check, cashmere-silk turtleneck with frosted effect, pure wool mélange flat-front pants, vegetable-dyed calfskin Goodyear loafers. 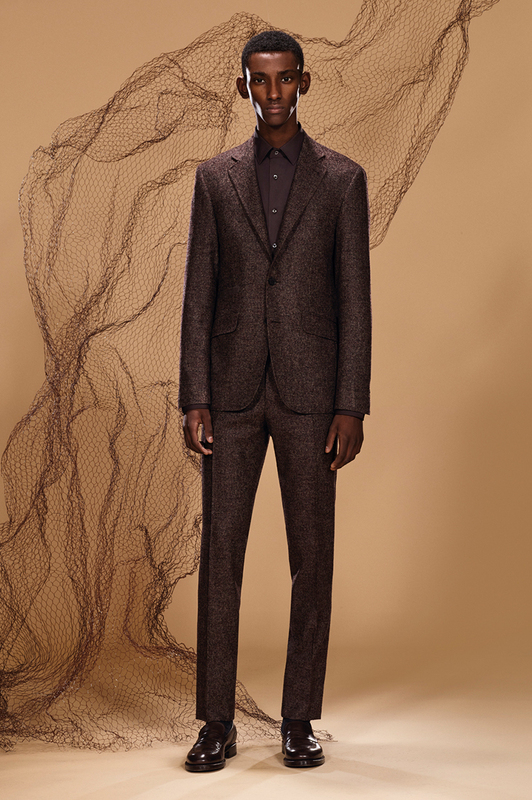 Micro-bouclé wool suit consisting of single-breasted blazer and flat-front pants, pure cotton poplin shirt, vegetable-dyed calfskin Goodyear derby shoes. 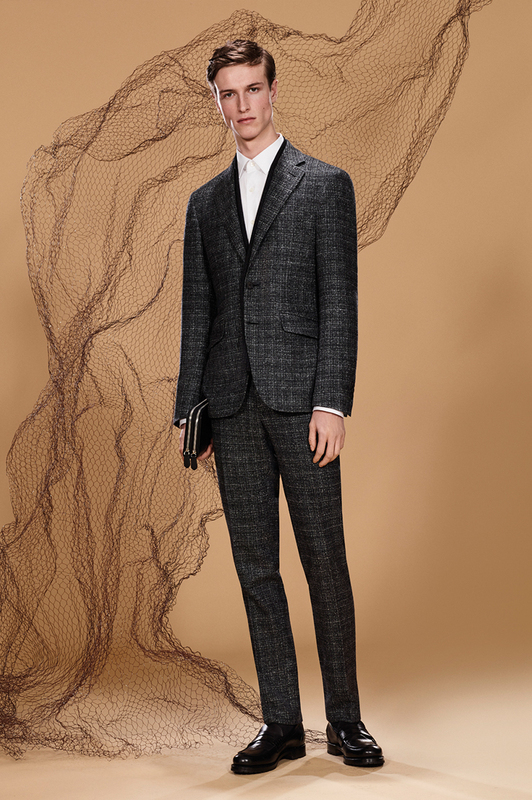 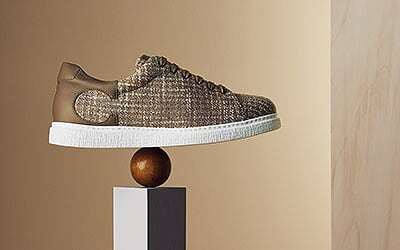 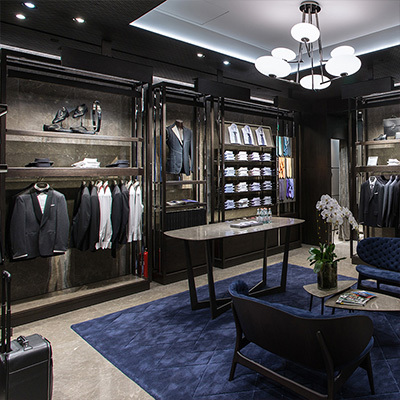 Cashmere-vicuña herringbone suit consisting of double-breasted blazer with contrasting phone pocket and flat-front pants, vegetable-dyed calfskin Goodyear loafers with brogueing.